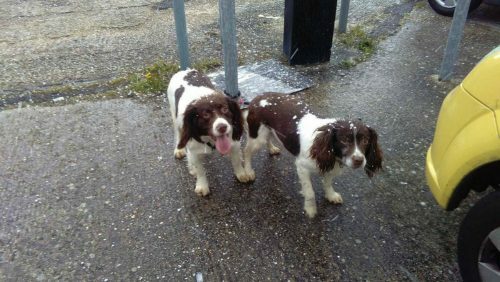 These two gorgeous Liver (Brown) & White Springer Spaniel girls were found and we’re in the care of Adur & Worthing Council. They have now been Adopted out by the Dogs Trust as a pair. Meg and Poppy have been well cared for and are great dogs for rehoming; they are friendly and well socialised and great walking on leads. We believe they would make great companions for someone and we would like to rehome them as a pair as they are mother and daughter and have stayed together since birth some 6 years ago. Once the seven day period ends, the dogs become the property of the Council. We can rehome them ourselves once a potential owner comes forward and we vet them and their home etc. 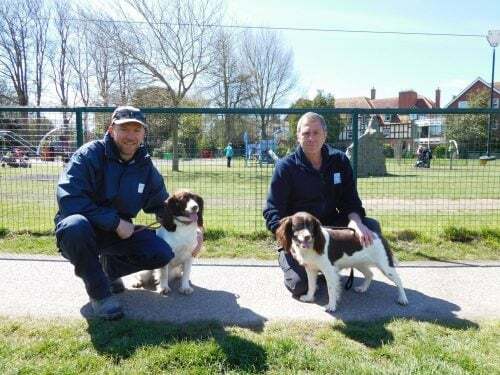 These dogs however are scheduled to be transferred to our colleagues at the Dogs Trust as the pair are a special case and need to be rehomed together. The Dogs Trust have kindly agreed to take them on as soon as a space becomes available. The Springer Spaniels are chipped but the details were still linked to previous owners from a long way away and a long time ago. However the chips gave us their names. Meg is about 10 years old and Poppy is 6. Both seem well and happy to be with us. Are they familiar to you? Has someone suddenly stopped visiting the park that you go to? Do you think you might know their family? If anyone has any ideas who they belonged to we can be contacted via email on “dogs.wardens@adur-worthing.gov.uk” or by phone at our contact centre, 01903 231064. Please share this page to your social media accounts.